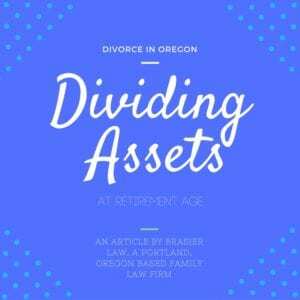 Dividing Assets is one of the major obstacles in an Oregon divorce. In Oregon, assets are almost always divided evenly, but that means different things depending on the stage of life and length of your marriage. This article covers dividing assets as you approach retirement, and our next article will cover dividing them when divorcing earlier in life. The main obstacle when dividing assets later in life tends to be the issue of pending retirement. The court always does what is “fair and equitable”. So, when you are getting divorced near retirement age, the court has to strongly consider the implications for both parties availability of resources on which to retire. There tends to be a strong connection between dividing your assets at later stages of life, and spousal support. For example, if one party makes significantly more money than the other, and both are in their late 50’s, then the court needs to enter a well thought out spousal support order coupled with the division of assets to help ensure both parties have the ability to retire. This often can mean the judge elects to give more of the available retirement assets to the party with less income, while giving some of the less liquid assets to the person who makes more money. It also may mean that the court can try to give the marital home to the person with less income to save them from having a mortgage payment. The complexity of divorce cases means the decision could result in the exact opposite outcome. The judge might give more spousal support to the lower earner, and not worry so much about how to divide the assets. This is one reason we always suggest consulting with an experienced Oregon family law attorney about your specific divorce case. Each case has it’s own complexities that can cause varied and nuanced approaches and outcomes. In Oregon, retirement accounts are assets, not income, even a pension. The Oregon courts have decided that retirement accounts are assets, not sources of income, even if they come in the form of a pension. This makes little sense, because a pension, by its very nature, is a source of income. If you are getting divorced in a later stage of life, it is important to consult with a local family law attorney to be sure that your divorce is allowing you to be provided for through your retirement. You may also be interested in reading about protecting your business during a divorce, as a business is also considered an asset. Another factor to consider in asset division is how dividing sentimental items works, please feel free to read more about sentimental and low cost items in the article linked here. Tom Brasier is an experienced family law attorney focused on divorce, custody, and restraining orders in the greater Portland, Oregon and Clark County areas. Tom is licensed in Oregon and Washington and he can be reached at Brasier Law by calling 1 (503) 855-4777 or by using the contact form below.